JNN 07 Nov 2014 : Sweden has recognized the occupied state of Palestine officially, according to its foreign ministry. The Scandinavian has become the first West-European EU state to recognize the territories. Israel has recalled its ambassador in Sweden. The news follows an earlier hint by Prime Minister Stefan Lovfen in his Social Democrat manifesto, during his inaugural address in October, that this would happen. The idea was quickly met with criticism from the United States and Israel. “Our decision comes at a critical time because over the last year we have seen how the peace talks have stalled, how decisions over new settlements on occupied Palestinian land have complicated a two-state solution and how violence has returned to Gaza,” Foreign Minister Margot Wallstrom told reporters. “Today’s recognition is a contribution to a better future for a region that has for too long been characterized by frozen negotiations, destruction and frustration,” she wrote earlier on Thursday in the daily Dagens Nyheter. Palestinian leader Mahmoud Abbas has already welcomed the “historic” move by Sweden. “President Abbas welcomes Sweden’s decision,” Nabil Abu Rudeina, the leader’s spokesman told AFP. The reaction from Israel followed soon after: “The decision of the Swedish government to recognize a Palestinian state is a deplorable decision which only strengthens extremist elements and Palestinian rejectionizm,” the Jewish state’s Foreign Minister Avigdor Lieberman said. Later in the day, Israel’s Foreign Ministry said the country is recalling its ambassador in Sweden for consultations in protest of the move. Lieberman even considers permanently removing the ambassador, Isaac Bachman, from his position, reported Haaretz. This move would officially downgrade Israel’s relations with Sweden. Wallstrom rejected accusations that Sweden was taking any sides in the matter. The troubled Muslim territories of the West Bank and the Gaza Strip have been seeking autonomy from their Jewish occupiers for decades now, with many people having perished in one of the most prolonged and bloody confrontations in history. The Palestinians have in this time also lobbied for foreign players to accept their claim to a sovereign state. Those fighting for Palestine – currently Hamas – are labeled as “terrorists” by Israel, so Wallstrom thinks a voice must be given to what she sees as the more moderate part of the population. The politician believes this will place them on a more equal footing with Israel in peace talks that historically often flounder. “EU members confirmed in 2009 their readiness to recognize the state of Palestine when it was appropriate,” Wallstrom said. She added that the fact that the Palestinians don’t have full control of their land or have fixed borders should not be an obstacle to international recognition. A vote at the UN General Assembly in 2012 secured a de facto Palestinian statehood, although a ‘yes’ vote from most EU members is still pending. While Sweden is the first EU member in Western Europe to have recognized the state, Bulgaria, Cyprus, Malta, Romania, Poland and the Czech Republic have already done so. 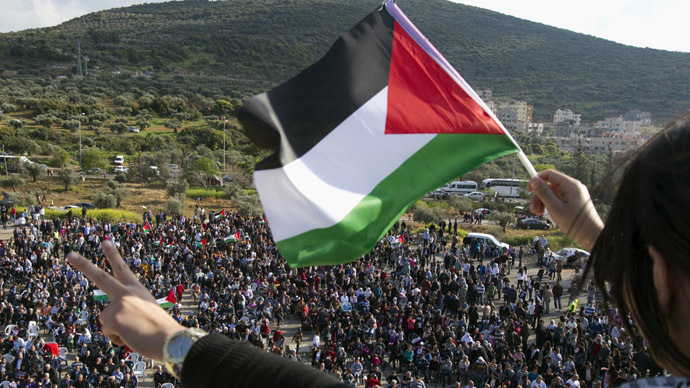 Iceland – the only non-EU member in the pack, has also recognized the Palestinian state. This entry was posted in Europe, Middle East and tagged israel, Palestine, Palestinian State, Sweden. Bookmark the permalink.